This is not exactly the ideal way to clean your fireplace glass doors. The cloths tend to create streaks on the glass, the basin of water is awkward to transport, not to mention, the water quickly becomes a thick mass of ashy sludge. Household ammonia always has to be used with care. The noxious fumes are unpleasant even when ammonia is neutralized in a ratio of one part ammonia to three parts water. 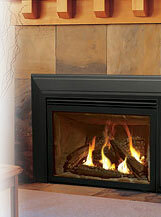 It's important to ventilate the room where the fireplace is located properly to avoid a reaction to ammonia vapors. This is most likely the least safest way to clean fireplace glass doors. There is also the possibility of seriously scratching glass panes in the fireplace door frame. This depends on how much residue will be removed. Take extreme care when using a razor blade for this job. There's no avoiding the job of keeping fireplace glass doors clean. It's a chore that can't really be ignored for very long. It just doesn't have to add to other domestic chores. An experienced contractor can save you from a messy chore. In addition, your contractor will offer a regular annual maintenance contract that tracks each cleaning of your fireplace doors. This post was brought to you by Phil Henderson, President of Henderson Properties, a leading community association management company based in Charlotte, NC.